To control the amount of liquid from the zucchini, you process the squash with water to liquefy it and then measure out the amount of the mixture that you need. 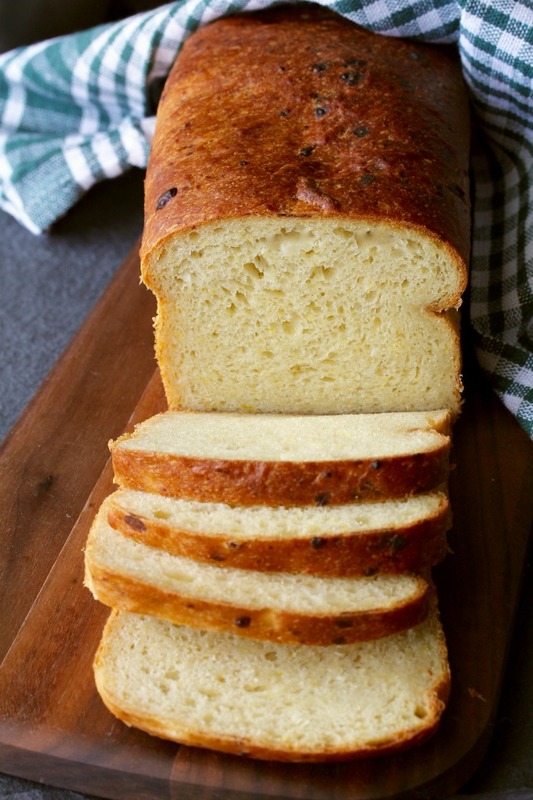 The resulting bread is soft and moist, and absolutely flavorful. I might just experiment with this technique with other watery vegetables or fruits. This is an easy recipe, perfect for novice bread bakers. It's also a great way to use up some of the zucchini you probably were gifted (or grew yourself) .... and the kids will have no idea that there are vegetables in there. Did you know that August 8 is National Zucchini Day, or as some call it, National Sneak Some Zucchini Onto Your Neighbor’s Porch Day? That's exactly what my cousin the suburban farmer did. I stepped out of the front door a few days ago and there was a big box of home grown veggies, including zucchini, crookneck squash, and pattypan squash. The box also included radishes, tomatoes, a frozen bottle of freshly squeezed orange juice, avocados, blackberries, and lots of home grown onions, including the red onions included in this bread. She's amazing. 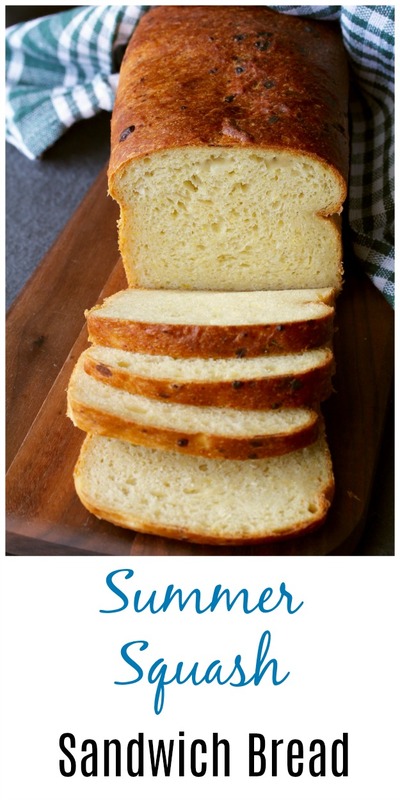 You can use any summer squash in this bread. The first time I made this bread I used cupcake squash, also known as cupcake zucchini. It's similar to zucchini, but sweeter. You can check it out cut up in this summer squash succotash. P.S. This bread recipe calls for a stand mixer, but you can also knead it by hand for 10 minutes. Do you need more ideas for using up all of the zucchini your neighbor left on your porch? 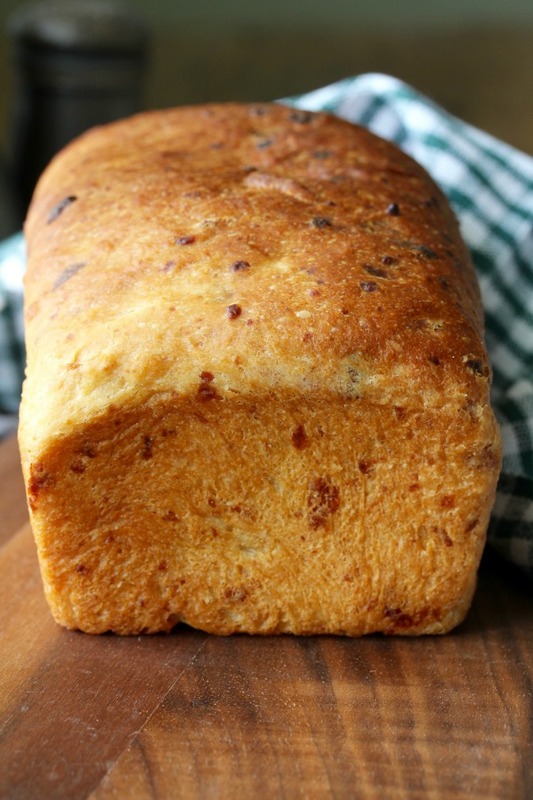 Pictured below are nine recipes I can swear by, and after the recipe for this bread, there are even more delicious recipes from the Foodie Extravaganza group. This is just a sampling. Just drop zucchini into the search box above to find more. 1 cup (4 ounces) shredded white cheddar cheese. I also recommend Gruyère cheese. Add the shredded zucchini and the water to the bowl of a food processor or blender. Process until liquefied. Measure one cup of the puree. In the bowl of a stand mixer, add one cup of the zucchini mixture, the yeast, honey, vegetable oil, and stir. Add the flour and mix with a dough whisk or large wooden spoon. Allow the mixture to sit for 10 minutes. Add the salt, onions, and cheese, and mix with the dough hook for 5 to 8 minutes, until the dough is tacky, but not sticky. Add more flour or water to adjust as necessary. Place the dough into an oiled bowl or dough rising bucket, cover, and let rise until doubled, approximately two hours. Preheat your oven to 350 degrees F, and oil an 8 1/2 inch by 4 1/2 inch loaf pan. Shape the dough into a log, and place it in the pan. Cover with oiled plastic wrap, and let rise until doubled, about an hour. Place the loaf in the oven and bake for 30 minutes. The bread should be browned and reach an internal temperature of about 190 to 200 degrees F. Cool in the pan on a wire rack for about 10 minutes, brushing the top with melted butter while it's cooling. De-pan the loaf and cool completely on a wire rack before slicing. Foodie Extravaganza is a monthly food fest, where a group of bloggers all create and share a recipe around one of the monthly food 'holidays' as detailed in The Nibble. 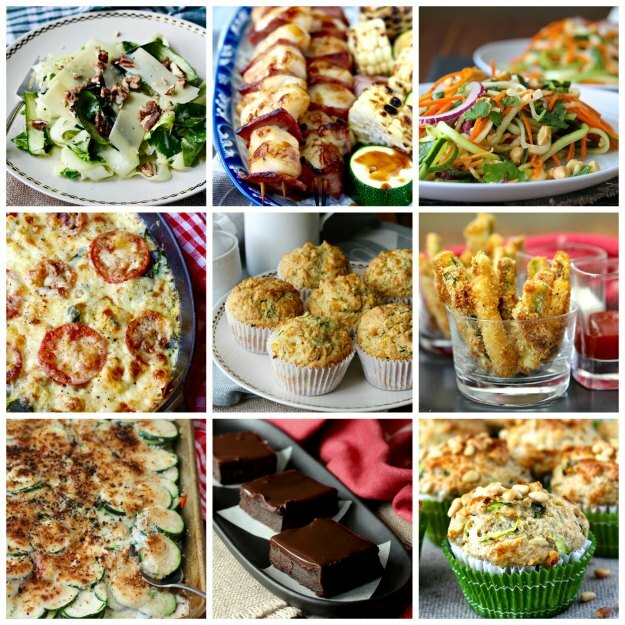 This month, Sue of Palatable Pastime is hosting, and zucchini is our theme. Posting day is always the first Wednesday of each month. If you are a blogger and would like to join our group and blog along with us, come join our Facebook page Foodie Extravaganza. We would love to have you! Love the processing in water tip and yes, I can see that this bread would make an amazing grilled cheese sandwich. You are such an amazing bread baker! Love the idea of putting zucchini into a sandwich bread, I've only ever done it in quick breads. Awww. Thanks Jolene! You'll have to try it in yeast bread. Ha ha. I don't have the patience (or the space in my teeny tiny backyard) to do what my cousin does. I guess the cupcake zucchini was invented in 2015 by Burpee. It's pretty tasty, but you can't find it in stores. Karen, this looks amazing. You and your breads make me so envious. Thank you Camilla. I bet you'd be amazing at breads! Karen, I can't tell by looking at the picture - did you peel and seed the zucchini?? I did seed the larger oen, but I didn't peel it. For the smaller ones, I just cut them into chunks and whirred them in the blender. How wet should my dough be?? It's a pretty sticky dough. 8 ounces of the zucchini/water mixture to the 14 ounces of flour. Wonderful zucchini bread, these slices are perfect for sandwiches. This looks wonderful and I've kept thinking I'd like to try a savory zucchini bread so this will be a great place to start. I never tried to use zucchini or yellow squash in yeast bread. Yours looks amazing! Oh my...how dreamy! Makes me want to eat a sandwich right now!! !